Executive Director Jon Rausch has been named one of Cushman & Wakefield’s Top 20 Industrial Brokers in the Americas (North and South America) for his 2015 performance. 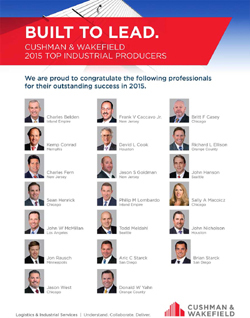 The annual list recognizes top-producing brokers in the Cushman & Wakefield platform in the Americas. Rausch specializes in land services primarily in Minnesota and Western Wisconsin. Congratulations Jon!